NEWS-TIMES PHOTO: TRAVIS LOOSE – Northbound travelers on Fern Hill Road now pass one of the nine new welcome signs–with a new logo–being added along Forest Groves city limits. The new signs also bear an updated population and city motto. 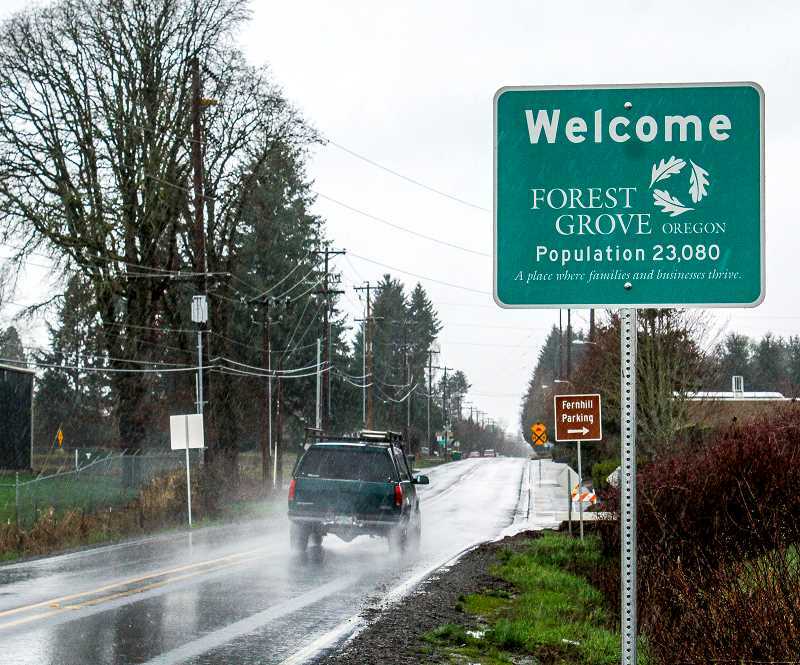 Forest Grove Public Works employees installed new welcome signs along the city’s perimeter in the pouring rain last Thursday, Feb. 18, replacing a few old ones and adding new ones where signs didn’t formerly exist. The signs include another new city feature: its new official logo. “We wanted something distinctive,” Forest Grove Mayor Pete Truax said of the symbol, which comprises three oak leaves arranged in a circle. Because the Oregon white oak is the official city tree, the pattern “is just a natural step for us to take,” Truax added. Designed in November 2006, the circular oak leaf pattern will replace what had been seven different designs representing various departments in the city. 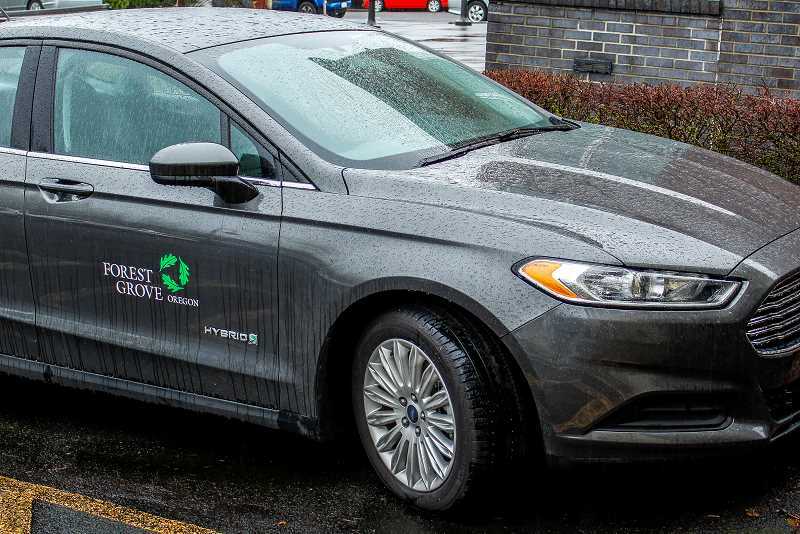 From a racing stripe pattern to the city’s name in a basic dark green, lowercase font, the city’s brand “was all over the place,” said Economic Development Director Jeff King. NEWS-TIMES PHOTOS: TRAVIS LOOSE – City cars will all be updated with the new logo. The new welcome signs replace old ones on Sunset Drive, Gales Creek Road, B Street and Highway 8 on the east side of town, and have been added to spots where no signs previously existed, including Thatcher, Ritchey, Fern Hill and Martin roads, as well as on Highway 47 where it crosses over Gales Creek. That last sign is still awaiting approval from the Oregon Department of Transportation because it would be attached to a state highway. The city’s official letterheads, business cards and vehicles will also receive the updated logos. 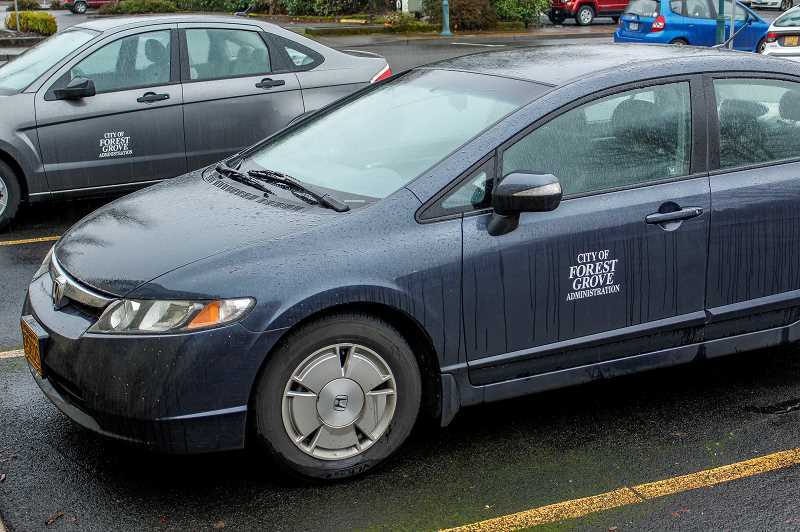 City cars now have new logos on the side. Police, fire and Light & Power vehicles will get a smaller version of the logo, said City Manager Jesse VanderZanden. Getting the symbol out into public view was the first step toward new city branding efforts that started about a month ago. The new design will also be registered with the state and trademarked, VanderZanden said.